As one of the world’s leading manufacturers of notebook PCs, smart devices, data centre equipment and LCD products, with factories in Taiwan, China, North and South America, Compal seeks to design its products in ways that minimise environmental pollution Tweet This!, preventing hazardous substances from being released into the environment. 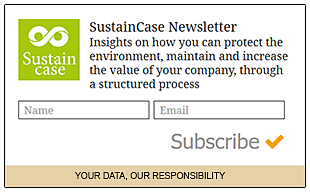 This case study is based on the 2017 Corporate Social Responsibility Report by Compal published on the Global Reporting Initiative Sustainability Disclosure Database that can be found at this link. Through all case studies we aim to demonstrate what CSR/ ESG/ sustainability reporting done responsibly means. Essentially, it means: a) identifying a company’s most important impacts on the environment, economy and society, and b) measuring, managing and changing. In its 2017 Corporate Social Responsibility Report Compal identified a range of material issues, such as economic performance, market presence, labour-management relations, customer health and safety. Among these, reducing the environmental impact of its products stands out as a key material issue for Compal. To identify and prioritise material topics, Compal engaged with its stakeholders through questionnaires, which were complemented by a new round of stakeholder surveys in 2018. 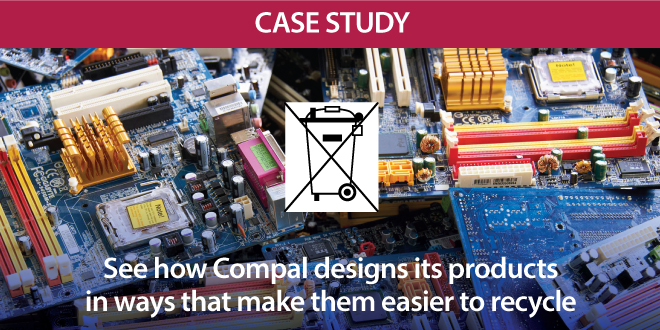 What actions were taken by Compal to reduce the environmental impact of its products? In addition, Compal designs all its products in accordance with WEEE (Waste Electrical and Electronic Equipment) standards, which require that at least 65% of the materials used are recyclable. For main notebook brand clients, Compal designs products to enable an even higher recycling rate (96%-100%). In 2011, Compal launched its patented square package design, which not only requires fewer resources but also enables consumers to keep the package and use it as a storage box. In 2012, Compal replaced EPE (Expanded Polyethylene) materials with 100% recyclable cardboard. In 2014, Compal increased the number of products per pallet from 78-84 to 102-120. In 2015, Compal optimised EPE cushions for notebook PCs by consolidating the old 3-piece design into a single piece. By doing so, Compal reduced the use of packaging materials by 50% and materials surface by 48%. In 2017, Compal greatly increased the use of automated equipment for picking, sealing, labelling and exterior examining before shipping, to reduce the human error rate. Note to Compal: With each case study we send out an email requesting a comment on this case study. If you have not received such an email please contact us.